Make sure you have a way to monitor financial risk in public companies - if you aren't proactive, you may be facing trouble. A global crisis is growing. 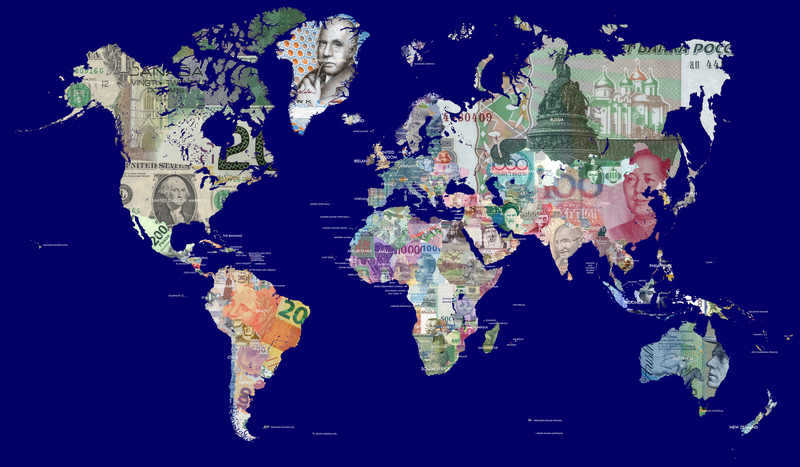 Global debt is higher than it's ever been, driven by historically low interest rates. Risky industries like retail, oil & gas and printing & publishing make headlines daily and are even riskier now than they were at the start of the Great Recession. 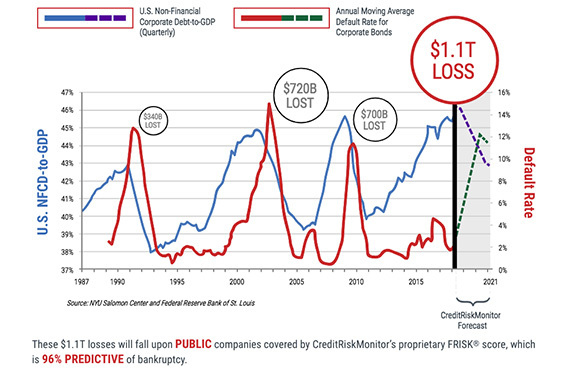 In fact, more companies are likely to fail in the 12 months of 2019 than when the Great Recession first began in late 2007. And as this benign credit cycle continues, the debt problem grows even larger. History indicates a spike in defaults is coming. We can refer to this as "follow the dotted line." The visual evidence shows that every peak in the ratio of debt-to-GDP is followed by a peak in defaults. If this cycle repeats itself, the average default rate could soar past 12 percent - or even higher. Estimated losses would be in excess of one trillion dollars ($1,000,000,000,000), including hundreds of billions in pensions and 401Ks. The Debt-to-GDP problem in the U.S. is huge. Debt in the United States is 3.5-times the gross domestic product (GDP). If a debt of $67 trillion goes down just 10 percent, then close to $7 trillion of wealth vanishes. Compare this with the $19 trillion of GDP. When wealth vanishes, people will by nature spend less, leading to potential huge, fast economic decline. Source: Ned Davis Research, Inc. Junk debt has exploded in the U.S. and around the world. Junk debt has exploded over the last two decades in the U.S.
Last year, it was estimated that junk debt, including leveraged loans, pushed to record highs as it reached $2.5 trillion. And this figure continues to grow. Source: NYU Salomon Center estimates using Credit Suisse, S&P and Citi data. European junk bond investors are in mania. Though things are dangerous in the U.S., in many ways the European landscape is worse as we enter an age of currency wars and tariff standoffs. Euro junk bond investors are certainly "risk on," incurring massive debts to keep their economies afloat: a perfect picture of mania. Source: Board of Governors of the Federal Reserve System (US), 10-Year Treasury Constant Maturity Rate [DGS10], retrieved from FRED, Federal Reserve Bank of St. Louis; Sept. 12, 2017. There’s been a huge growth [in debt-to-GDP] mainly because investors are searching for yield. When investors search for yield, it’s 'risk on.' And we’ve been in a benign cycle and people let their guard down when things are going so well. We provide the tools you need to avoid risk. Prepare now before the cycle turns. Our CreditRiskMonitor team is ready to help you stay ahead of both public and private company bankruptcy risk.